Light bulbs used to be simple—just run a bunch of electrical current through a thin wire until it heats up enough to start glowing. Bare filament electric lamps were first demonstrated around 1800 by Humphry Davy. Then, the glass bulb was added later to keep oxygen away from the wire so it could glow for a long time without actually burning up. Furthermore, the incandescent light bulb is 19th-century technology. Today, there's now a blinding array of electric lamps—halogen light bulbs, fluorescents, mercury and sodium vapor lamps—LEDs, lasers and so on. Each one makes its own clever use of physics to achieve the life goal of a light bulb; converting electrical current into visible light. Here's how they work. Halogen bulbs have the same tungsten metal filament as typical incandescent light bulbs. However, they contain a little bit of a halogen-based gas in the bulb as well. The chemistry of the halogen gas allows it to capture stray tungsten atoms that evaporate off the filament and shepherd them back to where they belong. Which both prolongs the life of the filament as well as keeps the inside of the bulb clean and clear. Fluorescent bulbs are basically gas-filled tubes with electrodes at both ends. Electrical current flows from one electrode to the other. When the electrons that make up the current bump into mercury atoms in the gas. The energy of the collision makes the atoms get "excited"—that's the technical term—and the atoms then emit visible and ultraviolet light. The white coating on the inside of the glass absorbs the ultraviolet light and re-emits it as more visible light—this process is called "fluorescence" and is the namesake of the bulbs. Because the coating stops the UV light, it also keeps the bulbs from giving you cancer—unless that's what you want. In which case you can use a tanning bulb with a different kind of coating. Sodium, mercury, and metal-halide vapor lamps, which are commonly used for lighting streets, warehouses, gymnasiums, and other large areas, are also tubes that run electrical current through a gas. The gas itself emits mainly visible light so these bulbs don't need a fluorescent coating. Finally, LEDs are also like fluorescent light bulbs, except replace the gas with a tiny crystal of semiconducting gallium, and throw away the bulb—so not like fluorescent bulbs. But seriously, the semiconductor has two layers, one of which provides excited electrons, while the other provides a place for the electrons to go and “relax”—and that is the technical term. All you need is an electrical current to transport electrons from the party side to the spa side where they release the energy of their excitement as light. 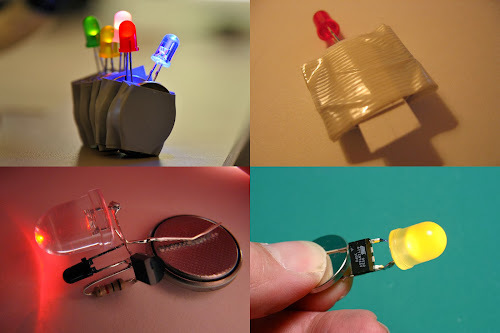 Voilá—a light-emitting diode, perfect for human parties! Thank you for reading The Evolution of Light Bulbs: Ancient Bulb to the Modern LED posted on the website Kwentology if you want to redistribute this article please include the link as the source. Have some kuwento to share? Contact us!